5 × = 35 Required Please enter the correct value. Blue chip stocks had their best week since April last week, with the Dow Jones Industrial Average gaining 2.5% for the week. That 30-stock index is now up 7.9% for the year, according to The Wall Street Journal. The Dow gained 17.64 points, or 0.1%, on Friday, ending the day and the week at 13,442.52. Stocks posted the increase for the week in the face of a 3.1% jump in oil prices, which ended the week at $79.10 a barrel, up 2.40. Oil prices hit a record $80.09 a barrel on Thursday. 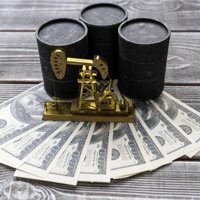 Rising prices – especially with such key elements as oil – can be bad for corporate profits because they increase company expenses. And that can translate into lower share prices. This will no doubt factor into the analysis of the U.S. Federal Reserve's policymaking Federal Open Market Committee (FOMC), which meets tomorrow (Tuesday). Most analysts are expecting a quarter-point rate reduction, reasoning the central bank must increase liquidity to counteract a growing global credit crunch. On other indices, the tech-laden Nasdaq composite index closed Friday at 2602.18, up 1.12 points. For the week, the Nasdaq rose 36.48 points, or 1.42%. The index is up 7.7% so far this year. The broader Standard & Poor's 500 Index rose 30.70 points, or 2.11%, for the week, closing at 1484.25. The S&P 500 is up 4.6% so far this year. Gold finished the week at $709.60 per ounce, rising $8.80 an ounce, or 1.26%.